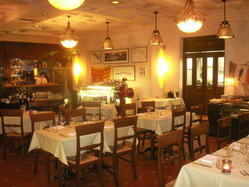 Is it unnecessary to review well-known restaurants, places that, to many, are already on their standby list? Perhaps. But in case you haven’t already heard, Mangia Pesce is the solid option for your first date/birthday/dinner with the parents/friend’s in town/anniversary/casual night out. Put them on your speed dial. The versatility offered by this restaurant starts with the decor and ends with it’s colorful dessert tray. Now that the weather has warmed up, there is a choice of indoor or sidewalk patio seating. It’s interior is simple and without pretense; unusual for a nicer Tokyo restaurant. There is a definite attempt to bring a European feel to the design, but it is subtle, as are the fish motifs strategically incorporated to reinforce that the house specialty is fish. On most visits to Mangia Pesce, I have come as a casual visitor; usually meeting up with a friend or two who are hankering for some Japanese-influenced Italian food. 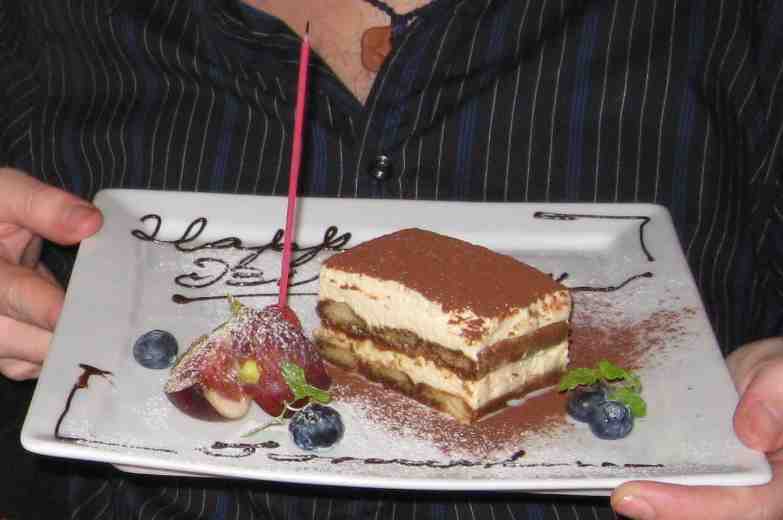 Although inevitably there are guests there dressed ‘n pressed, having a piece of candlelit birthday cake brought to them for a quiet birthday dinner, there is also always a mix of clientele, and showing up in jeans is perfectly acceptable. As I mentioned before, fish is the specialty here, and it is fresh and delicious. The menu allows you to combine the type of fish, how you would like it cooked, etc., as you wish, however, the wait staff is always very helpful with suggestions. My suggestions, however, are not of the fish variety. However many times I come back, what continues to amaze me is the quality and freshness of the vegetables. The best green salad in town, with whatever vegetables are freshest, is considered an appetizer, but when I’m feeling hungry, I go right ahead and ask for 1.5 portions. Really hungry, and they are happy to serve me a plate 2 portions large. 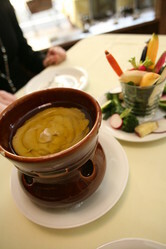 Also featuring veggies, is the stellar bagna cauda. Crisp vegetables to dip into a heated at the table fondue-like bowl of garlic-anchovy oil. Also on the appetizer menu, is a delightful little foie gras croquette. A tiny morsel of richness, and for many, just as much foie gras as they can take in one sitting. On my last visit this dish was a little too salty, but on the whole, it has been a winner of a dish. Think you can handle more of the foie gras? Try the foie gras pasta. 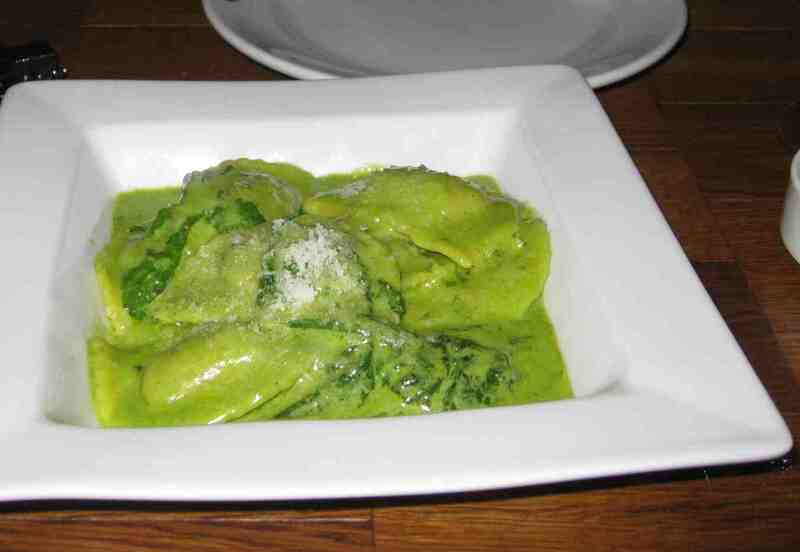 The fresh-made pasta here is light and perfectly cooked. Also refreshing is the fish carpaccio, make sure to ask for extra tomatoes. These are just some highlights of a truly rich menu that is constantly being updated. 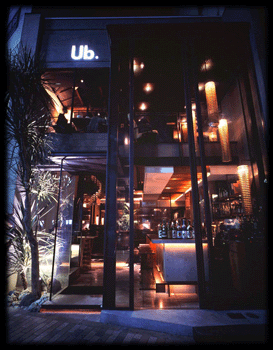 The impressive wine list is complemented by seasonal changes: currently, there is a fair of belgian beer, and the wait staff will gladly recommend dishes to complement each one. Other features include various lunch sets (not bad, although I much prefer the dinner a la carte), and party plans. I previously had a party here for about 15 people, however, and did not feel the quality quite lived up to dining on my own. My advice if you’re planning a party would be to negotiate the menu carefully with the staff, instead of choosing one of the pre-arranged sets. Could there possibly be more important features? Just one. While the kitchen is not technically an open kitchen, the door is always wide open, and the curious can catch glimpses of the action. In fact, the head chef is always on hand as well, sometimes assisting with the serving. But for the more ambitious, cooking classes are also offered. To be able to create a little of this place at home would definitely be a skill worth learning.